DUBLIN and NEW ORLEANS - May 1, 2018 - Medtronic plc (NYSE: MDT) today announced the launch of a titanium 3D printed platform - TiONIC(TM) Technology - that enables more complex designs and integrated surface technologies for spine surgery implants. The announcement was made during the American Association of Neurological Surgeons (AANS) annual meeting in New Orleans, La. TiONIC Technology is a 3D printed technique that creates enhanced surface textures by utilizing a differentiated laser method. Compared with smooth materials, surface texture has been shown to increase osteoconductivity and promote bone response1,2. 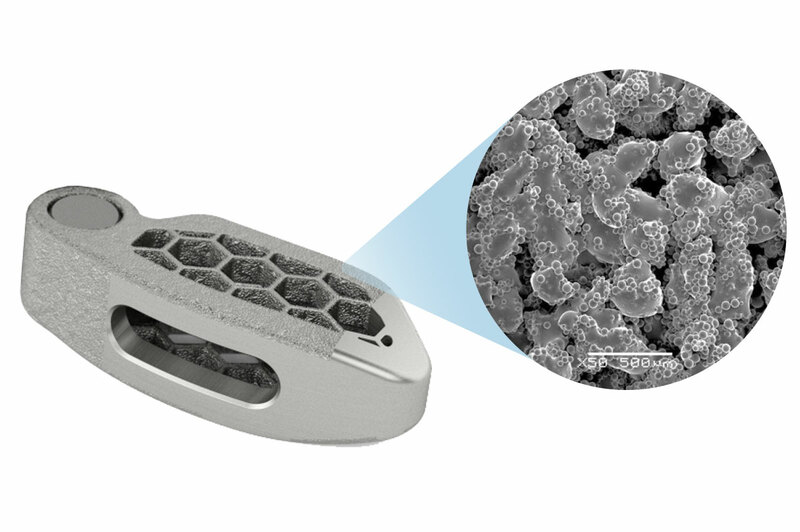 And unlike traditional manufacturing techniques, the 3D printing process allows for more intricate implant designs such as the honeycomb shape on Medtronic's recently launched ARTiC-L(TM) Spinal System. "Surface advancements, like TiONIC Technology, have emerged as a paradigm shift in interbody fusion implants," said Dr. Colin C. Buchanan, neurosurgeon at the Colorado Brain and Spine Institute, in Aurora, Colo. "Implants utilizing newer surface technology can help stimulate a cellular response and give me greater confidence that the patient will have a successful fusion." ARTiC-L is the first implant from Medtronic to be manufactured using the TiONIC Technology 3D printing technique. The implant is made of titanium and designed for surgeons to use in transforaminal lumbar interbody fusion (TLIF) spine surgery. The implant's 3D printed honeycomb design acts as an osteoconductive scaffold for bony growth into the implant and provides improved mechanical load distribution across the implant. "ARTiC-L is an important component of Medtronic's portfolio of reproducible solutions for minimally invasive procedures," said Doug King, senior vice president and president of Medtronic's Spine division, which is part of the Restorative Therapies Group at Medtronic. "Our 3D printed TiONIC Technology allows devices such as ARTiC-L - and our future interbody implant portfolio - to offer surgical advantages not traditionally possible." Aside from utilizing TiONIC Technology, ARTiC-L enables a streamlined surgical workflow that requires only one instrument for implant insertion and positioning. The ARTiC-L system is designed to facilitate sagittal alignment of the spine by offering various lordotic angles up to 20 degrees. 1 Wennerberg, A. and Albrektsson, T. (2009), Effects of titanium surface topography on bone integration: a systematic review. Clinical Oral Implants Research, 20: 172-184. 2 Animal testing is not necessarily indicative of human clinical outcomes.